How do you cheer yourself up when you're full of cold and can't crack open a giant Toblerone? This pancake did the trick. 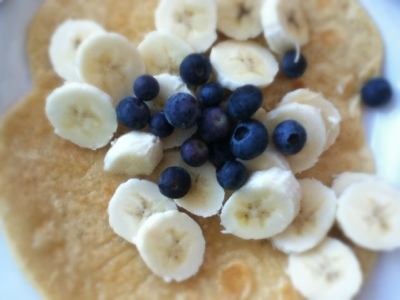 Made with gram flour, cooked in a smattering of coconut oil, spread with a very thin layer of rapeseed honey and topped with banana and blueberries. Eaten in seconds. Full of lovely antioxidants and vitamin c and potassium..just what a girl with a cold should be eating. I hope you get well soon.